Finnish ski troops in Northern Finland in January 1940. The military history of Finland during World War II encompasses three major conflicts. The first two––the defensive Winter War in 1939–1940, and the Continuation War alongside the Axis Powers in 1941–1944––were waged against the Soviet Union. The third one, the Lapland War in 1944–1945, followed the signing of an armistice agreement with the Allied Powers, which stipulated expulsion of German forces from Finnish territory. By the end of hostilities, Finland managed to defend its independence, but had to cede nearly 10% of its territory, including its second largest city, Viipuri, and pay out a large amount of war reparations to the Soviet Union. As a result of this territorial loss, all Finnish Karelians were evacuated from their homes, relocating to areas that remained within the borders of Finland. The Grand Duchy of Finland, as the country was named until 1917. In 1809, the Russian Empire conquered Finland from Sweden in the Finnish War. Finland entered a personal union with the Russian Empire as a grand duchy with extensive autonomy. During the period of Russian rule the country generally prospered. However, in the early 20th century Russia tightened its grip on Finland, causing widespread resentment. When revolution broke out in Russia in 1917, Finland declared independence. In 1918 the Finnish Civil War broke out between the generally right-wing government supporters and left-wing rebels. The war ended with the victory of the government forces, supported by Germany, and the expulsion of Russian troops. During the inter-war period, the relationship between Finland and the Soviet Union was tense. 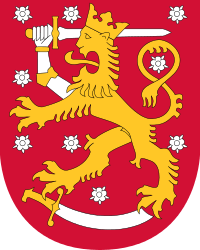 Some elements in Finland maintained the dream of "Greater Finland" which included the Soviet-controlled part of Karelia. The proximity of the Finnish border to Leningrad (now Saint Petersburg) caused worry in the Soviet leadership. On 23 August 1939 Nazi Germany and the Soviet Union signed the Molotov-Ribbentrop Pact. A secret clause of this agreement marked Finland as part of the Soviet sphere of influence. On 12 October the Soviet Union started negotiations with Finland concerning parts of Finnish territory, the Karelian Isthmus, the Gulf of Finland islands and the Hanko Peninsula. No agreement was reached. On 26 November the Soviet Union accused the Finnish army of shelling the village of Mainila. It was subsequently found that the Soviets had in fact shelled their own village to create an excuse to withdraw from their non-aggression pact with Finland. On 30 November the Soviet Union attacked Finland. The attack was denounced by the League of Nations and, as a result, the Soviet Union was expelled from that body on 14 December. The Winter War, fought between Finland and the Soviet Union, was an invasion by the Soviet Union. The aim of the invasion was to annex Finland whole into the Soviet Union. The very first attack on November 30, 1939 was an aerial bombardment of the city of Helsinki and all along the Finnish-Soviet border. This put the Finnish people on the defensive without having to make any decision, unifying the once divided country. The Soviet invasion was intended to be a liberation of the 'Red Finns,' with the eventual annexation of Finland into the USSR. To this end, a puppet government, the "Finnish Democratic Republic" was established in Terijoki under the leadership of the exiled O. W. Kuusinen. Strategic goals of the Red Army included cutting Finland in half and capturing Petsamo in the north and Helsinki in the south. The Soviets had been building their forces up on the border for several months during the previous negotiations. The Soviet Union fielded four armies composed of 16 divisions and another three were being brought into position; meanwhile, the Finnish army had 9 smaller divisions. In addition, Soviet forces enjoyed an overwhelming superiority in the numbers of armour and air units deployed. The problem with numbers was a Finnish issue as they had to defend a border that was some 1287 km (800 miles) in length, presenting the defenders with a significant disadvantage. The Winter War was fought in three stages: the initial Soviet advance, a short lull and then a renewed Soviet offensive. The war was fought mainly in three areas. The Karelian Isthmus and the area of Lake Ladoga was the primary focus of the Soviet war effort. A two-pronged attack, with one pincer engaging the Finnish forces on the Isthmus while the other went around Lake Ladoga in an attempt at encircling the defenders. This force was then to advance to and capture the city of Viipuri. The second front was in central Karelia, where the Soviet forces were to advance to the city of Oulu, cutting the country in half. Finally, a southwards drive from the north was to capture the Petsamo region. 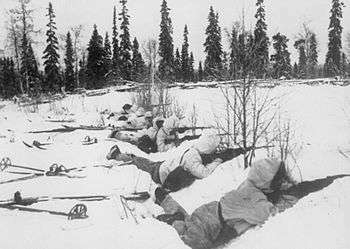 By late December, the two main fronts had come to a standstill as the Finns were counterattacking with more strength and the Soviets were being bogged down. With the failure of two of its three offensives by the end of December, the Soviet headquarters ordered a cessation of operations. By December 27 it was observed that the Soviet forces were digging on the Karelian Isthmus. In the north, however, the Finns had been pushed back to Nautsi and with reinforcements took the higher ground to halt the Soviet advance south of Petsamo. During this period the Finns are known to have been harassing supply columns and even some raid actions against fortified Soviet positions. A lull period followed in January 1940, as the Soviet army reassessed its strategy, rearmed and resupplied. The last phase began in February 1940 with a major artillery barrage that began on the 2nd and lasted till the 11th, accompanied by reconnaissance raids at key objectives. The Soviets, using new equipment and materials, also began using tactics of rotating troops from the reserve to the front, constantly applying pressure to the Finnish defenders. It seemed that the Red Army had inexhaustible amounts of ammunition and supplies, as attacks were always preceded by barrages, followed by aerial assaults and then random troop movements against the lines. Finnish military and government leaders saw that the only thing left to do was to negotiate a peace treaty with Moscow. The tenacity of the Finnish people, both military and civilian, in the face of a superior opponent gained the country much sympathy throughout the world. However, material support from other countries was small and none of Finland's neighbours were willing to commit their militaries to a war against the USSR. The need for a diplomatic solution became even more apparent, after the Soviet forces broke through the Finnish defensive line on the Karelian Isthmus and moved on towards Viipuri. A demanding peace proposal was sent to Finland by Molotov in mid-February, claiming more land for the USSR and significant diplomatic and military sanctions. By February 28, Molotov made his offer an ultimatum with a 48-hour time limit, which pushed the Finnish leadership to act quickly. The Finnish people were worn down and could no longer hold out against such vast, well-supplied numbers. By March 13, 1940 the Winter War was officially over, the Moscow Peace Treaty was signed and the Soviet Union had gained more territory than it originally demanded. Finland's concessions in the Winter War. The period of peace following the Winter War was widely regarded in Finland as temporary, even when peace was announced in March 1940. A period of frantic diplomatic efforts and rearmament followed. The Soviet Union kept up intense pressure on Finland, thereby hastening the Finnish efforts to improve the security of the country. Defensive arrangements were attempted with Sweden and Great Britain, but the political and military situation in the context of the Second World War rendered these efforts fruitless. Finland then turned to Nazi Germany for military aid. As the German offensive against the Soviet Union (Operation Barbarossa) approached, the cooperation between the two countries intensified. German troops arrived in Finland and took up positions, mostly in Lapland, from where they would invade the Soviet Union. The Finnish military took part in the planning for Operation Barbarossa, and prepared to invade the Soviet Union alongside the Germans in the north, and independently in the south. Operation Barbarossa began on 22 June 1941. On 25 June the Soviet Union launched a massive air raid against Finnish cities, after which Finland declared war and also allowed German troops stationed in Finland to begin offensive warfare. The resulting war was to be called the Continuation War. Relative strengths of Finnish, German and Soviet troops at the start of the Continuation War in June 1941. During the summer and autumn of 1941 the Finnish Army was on the offensive, retaking the territories lost in the Winter War. The Finnish army also advanced further, especially in the direction of Lake Onega, (east from Lake Ladoga), closing the blockade of the city of Leningrad from the north, and occupying Eastern Karelia, which had never been a part of Finland before. This caused Great Britain to declare war on Finland on 6 December. The German and Finnish troops in Northern Finland were less successful, failing to take the Russian port city of Murmansk during Operation Silver Fox. On 31 July 1941 the United Kingdom launched raids on Kirkenes and Petsamo to demonstrate support for the Soviet Union. These raids were unsuccessful. In December 1941, the Finnish army took defensive positions. This led to a long period of relative calm in the front line, lasting until 1944. During this period, starting at 1941 but especially after the major German defeat in the Battle of Stalingrad, intermittent peace inquiries took place. These negotiations did not lead to any settlement. On 16 March 1944, the President of the United States, Franklin D. Roosevelt, called for Finland to disassociate itself from Nazi Germany. On 9 June 1944, the Red Army launched a major strategic offensive against Finland, attaining vast numerical superiority and surprising the Finnish army. This attack pushed the Finnish forces approximately to the same positions as they were holding at the end of the Winter War. Eventually the Soviet offensive was fought to a standstill in the Battle of Tali-Ihantala, while still tens or hundreds of kilometres in front of the main Finnish line of fortifications, the Salpa Line. However, the war had exhausted Finnish resources and it was believed that the country would not be able to hold another major attack. The worsening situation in 1944 had led to Finnish president Risto Ryti giving Germany his personal guarantee that Finland would not negotiate peace with the Soviet Union for as long as he was the president. In exchange Germany delivered weapons to the Finns. After the Soviet offensive was halted, however, Ryti resigned. Due to the war, elections could not be held, and therefore the Parliament selected the Marshal of Finland Carl Gustaf Emil Mannerheim, the Finnish commander-in-chief, as president and charged him with negotiating a peace. The Finnish front had become a sideshow for the Soviet leadership, as they were in a race to reach Berlin before the Western Allies. This, and the heavy casualties inflicted on the Red Army by the Finns, led to the transfer of most troops from the Finnish front. On 4 September 1944 a ceasefire was agreed, and the Moscow armistice was signed on 19 September. The Moscow armistice was signed by Finland and the Soviet Union on 19 September 1944 ending the Continuation War, though the final peace treaty was not to be signed until 1947 in Paris. 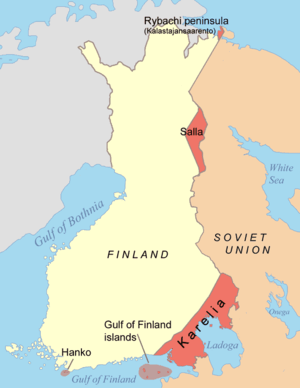 The conditions for peace were similar to those previously agreed in the 1940 Moscow Peace Treaty, with Finland being forced to cede parts of Finnish Karelia, a part of Salla and islands in the Gulf of Finland. The new armistice also handed the whole of Petsamo over to the Soviet Union. Finland also agreed to legalize communist parties and ban fascist organizations. Finally, the armistice also demanded that Finland must expel German troops from its territory, which was the cause of the Lapland War. The village of Ivalo destroyed by Germans during the Lapland War. The Lapland War was fought between Finland and Nazi Germany in Lapland, the northernmost part of Finland. The main strategic interest of Germany in the region were the nickel mines in the Petsamo area. Initially the warfare was cautious on both sides, reflecting the previous cooperation of the two countries against their common enemy, but by the end of 1944 the fighting intensified. Finland and Germany had made an informal agreement and schedule for German troops to withdraw from Lapland to Norway. The Soviet Union did not accept this "friendliness" and pressured Finland to take a more active role in pushing the Germans out of Lapland, thus intensifying hostilities. The Germans adopted a scorched-earth policy, and proceeded to lay waste to the entire northern half of the country as they retreated. Some 100,000 people lost their homes, adding to the burden of post-war reconstruction. The actual loss of life, however, was not catastrophic. Finland lost some 1,000 troops and Germany about 2,000. The Finnish army expelled the last of the foreign troops from their soil in April 1945. The war had caused great damage to infrastructure and the economy. From the autumn of 1944, the Finnish army and navy performed many mine clearance operations, especially in Karelia, Lapland and the Gulf of Finland. The sea mine clearance lasted until 1950. The mines caused many military and civilian casualties, particularly in Lapland. As part of the Paris Peace Treaty, Finland was classified as an ally of Nazi Germany, bearing its responsibility for the war. The treaty imposed heavy war reparations on Finland and stipulated the lease of the Porkkala area near the Finnish capital Helsinki as a military base for fifty years. The reparations were initially thought to be crippling for the economy, but a determined effort was made to pay them. The reparations were reduced 25% by the Soviet Union in 1948 and were paid off in 1952. Porkkala was returned to Finnish control in 1956. In subsequent years the position of Finland was unique in the Cold War. The country was heavily influenced by the Soviet Union, but was the only country on the Soviet pre-World War II border to retain democracy and a market economy. Finland entered into the Agreement of Friendship, Cooperation, and Mutual Assistance (YYA Treaty) with the Soviet Union in which the Soviet Union agreed to the neutral status of Finland. Arms purchases were balanced between East and West until the fall of the Soviet Union. During the Continuation War (1941–1944) Finland was co-belligerent with Nazi Germany against the Soviet Union, and dependent on food, fuel and armament shipments from Germany. In spite of this, Finland retained an independent democratic government. Moreover, during the war, Finland kept its army outside the German command structure despite numerous attempts by the Germans to tie them more tightly together. Finnish Jews were not persecuted, and even among extremists of the Finnish Right they were highly tolerated, as many leaders of the movement came from the clergy. Of approximately 500 Jewish refugees, eight were handed over to the Germans, a fact for which Finnish prime minister Paavo Lipponen issued an official apology in 2000. The field synagogue operated by the Finnish army was probably a unique phenomenon in the Eastern Front of the war. Finnish Jews fought alongside other Finns for their country's freedom. Approximately 2600 to 2800 Soviet prisoners of war were exchanged for 2100 Fennic prisoners of war from Germany. In November 2003, the Simon Wiesenthal Center submitted an official request to Finnish President Tarja Halonen for a full-scale investigation by the Finnish authorities of the prisoner exchange. In the subsequent study by Professor Heikki Ylikangas it turned out that about 2000 of the exchanged prisoners joined the Wehrmacht, but among the rest there were about 500 political officers or politically dangerous persons, who most likely perished in concentration camps. Based on a list of names, there were about seventy Jews among the extradited, although they were apparently not extradited based on ethnic grouping. During World War II, Finland was in many ways a unique case: It was the only European country bordering the Soviet Union in 1939 which was still unoccupied by 1945. Of all the European countries fighting, only three European capitals were never occupied: Moscow, London and Helsinki. It was a country which sided with Germany, but in which native Jews and almost all refugees were safe from persecution. It was the only co-belligerent of Nazi Germany which maintained democracy throughout the war. It was also the only belligerent in mainland Europe to do so. According to the Finnish records 19,085 Soviet prisoners of war died in Finnish prison camps during the Continuation War, which means that 29.6% of Soviet POWs taken by the Finns did not survive. The high number of fatalities was mainly due to malnutrition and diseases. However, about 1,000 POWs were shot primarily in escape attempts. When the Finnish Army controlled East Karelia between 1941 and 1944, several concentration camps were set up for Russian civilians. The first camp was set up on 24 October 1941, in Petrozavodsk. Of these interned civilians 4,361 perished mainly due to malnourishment, 90% of them during the spring and summer of 1942. Finland was never a member of the Axis powers as it never signed the Tripartite Pact, but was aided against the military assault by the Soviet Union by Germany, from the beginning of Operation Barbarossa 1941 to the separate peace with the Soviet Union in 1944. Finland was led by its elected president and parliament during the whole 1939–1945 period. As a result, some political scientists name it as one of the few instances where a democratic country was engaged in a war against one or more other democratic countries, namely the democracies in the Allied forces. However, it is worth pointing out that nearly all Finnish military engagements in World War II were fought solely against an autocratic power, the Soviet Union, and the lack of direct conflicts specifically with other democratic countries leads others to exclude Finnish involvement in World War II as an example of a war between two or more democracies. ↑ Jews in Finland During the Second World War – Vuonokari, Tuulikki; university paper at the Department of Translation Studies, University of Tampere, 2003. ↑ Farber, Henry S. and Gowa, Joanne. "Polities and Peace", International Security, Vol. 20 no. 2, 1995. ↑ Russert, Bruce. "The Fact of Democratic Peace," Grasping the Democratic Peace, Princeton, NJ: Princeton University Press, 1993. Condon, Richard W. The Winter War: Russia against Finland. New York: Ballantine Books, 1972. Jakobson, Max. The Diplomacy of the Winter War. Cambridge, MA, Harvard University Press, 1961. Polvinen, Tuomo. "The Great Powers and Finland 1941–1944," Revue Internationale d'Histoire Militaire (1985), Issue 62, pp 133–152. Kelly, Bernard. "Drifting Towards War: The British Chiefs of Staff, the USSR and the Winter War, November 1939–March 1940." Contemporary British History (2009) 23#3 pp: 267-291. Nordling, Carl O. "Stalin's insistent endeavors at conquering Finland." Journal of Slavic Military Studies (2003) 16#1 pp: 137-157. Vehviläinen, Olli (2002). Finland in the Second World War. Palgrave-Macmillan. Westerlund, Lars, ed. (2008). Sotavangit ja internoidut : Kansallisarkiston artikkelikirja [Prisoners of war and internees : a book of articles by the National Archives] (PDF) (in English, Finnish, and Norwegian). Helsinki: Kansallisarkisto. p. 568. ISBN 9789515331397. Retrieved October 25, 2016. Zeiler, Thomas W.; DuBois, Daniel M., eds. (2013). A Companion to World War II. Wiley-Blackwell. ISBN 978-1405196819. Wikimedia Commons has media related to Finland in World War II.